Bali Spa This large spa is located on a bypass towards Kuta to Sanur in Denpasar, and about 15 minutes from the Airport and Kuta. 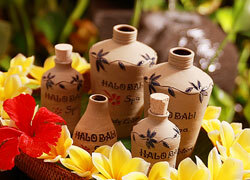 Halo Bali Spa is in a very convenient, so you can stop by after sightseeing in Ubud. 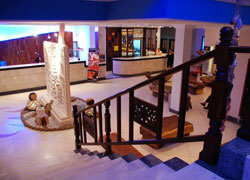 They have Shiatsu Massage without oil and Chocolate Massage which has been getting popular. They use all fresh natural products which has full of vitamin A such as rose, carrots, yogurt, honey, and so on. They provide water into skins and make them healthier and shinier. 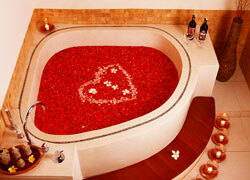 An exotic rich spa treatment with red wine and scrub removes toxin from the body. Your skins will become younger and get healthier. The wine they use for this treatment has more than 30 kinds of vitamins such as B1, B2, and D.
★The treatment is done in a VIP room. 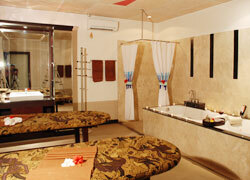 You can have a choice of fruits treatment and facial. Avocado contains vitamin A and vitamin E which helps removing wrinkles and protecting beautiful and radiant skins. 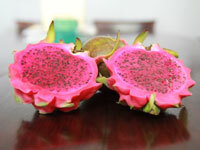 It is a unique treatment with dragon fruits which contains vitamin C, beta carotene and calcium. The fruits can help lowering the number of the cholesterol and a blood-sugar level. It also improves a blood circulation and prevents acne. A Treatment with Full of Fresh Strawberries which contains antioxidant and vitamin C makes skins brighter and smooth. Aloe has been useful and popular among people from a long time ago. It removes bacteria and works well to cool down sunburned skins. 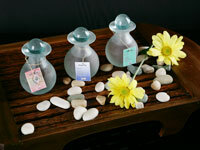 This is traditional massage with natural lavender or jasmine oil. It also includes scrub using natural essences. ★he treatment is done in a VIP room with an air conditioner. 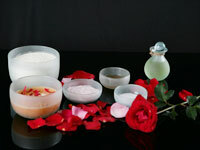 The massage with lotion, oil and natural stones detoxifies inside of the body and recovers an age of skins. They also use a natural essence of chocolate which has vitamin P and polyphenol which prevent cancer. It also improves blood circulation and removes spots. 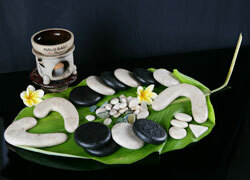 Warm Stone Massage with warmed volcanic stones has been popular among many spas, but Halo Bali Spa uses both warmed and cold stone. By using those two kinds, a balance of positive and negative energy is set, and increase healing power. There are various sizes of the stones and the therapist chooses a right size for a tight place. Recommended for anyone who has stiff shoulders, a joint pain and rheumatism. 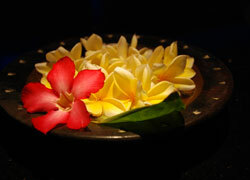 A combination of Balinese Massage, Thai Massage and Aromatherapy is recommended for anyone who want to remove tiredness and stiffness completely. A whole body massage which is a combination of Thai, Japanese and Balinese massages called “Inko” eases stiff muscles and relax a mind and a body. You will change into silk pajamas to enjoy the comfortable treatment. This is a mysterious treatment to remove earwax by warming up inside of the ear by a fired ear candle. You will be amazingly surprised how much of it comes out!!! 1 way (Pick up or Drop off) free transport is available for Sanur, Kuta, Seminyak for guest who booking 2 persons and 2 hours treatment. 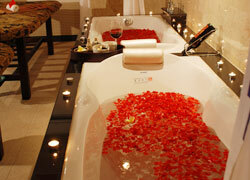 VIP Room has a bath and shower. Standard Room has just a massage room, so the staff leads you to a shower room. With extra charge, it is possible to switch rooms from standard to VIP. I went to spa after fully enjoyed marine sports. The sunlight was strong on daytime in Bali!! Sunburned in a bikini. I had treatments at spa after I got sunburn. It was good there was spa menu choice.